I have been saving some old boxes and cardboard tubes and plastic lids and such for the past several weeks… it’s so wonderful how you can recycle things you find around your home into something you needed and wanted, for free! 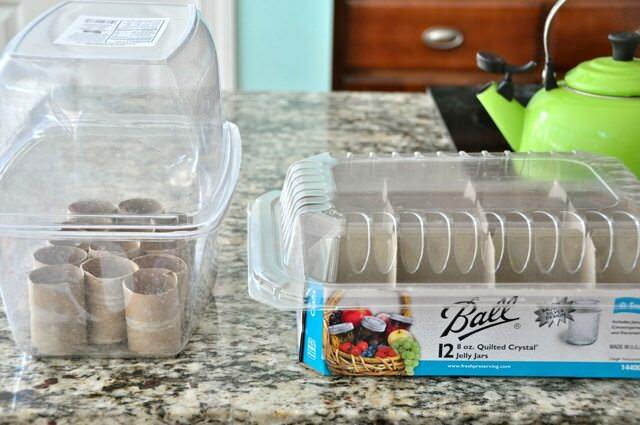 Today I’ll show you two different ways to create mini-greenhouses for your precious seedlings. Here are just some items from a large collection of recyclable goods I’ve been saving. After the planting season, I’ll just rinse out any plastics I’ve used and toss them back in the recycling bin. The cardboard I generally just plant right into the soil with the seedlings… that’s the advantage of using toilet paper and paper towel cardboard tubes for your seedling pots. 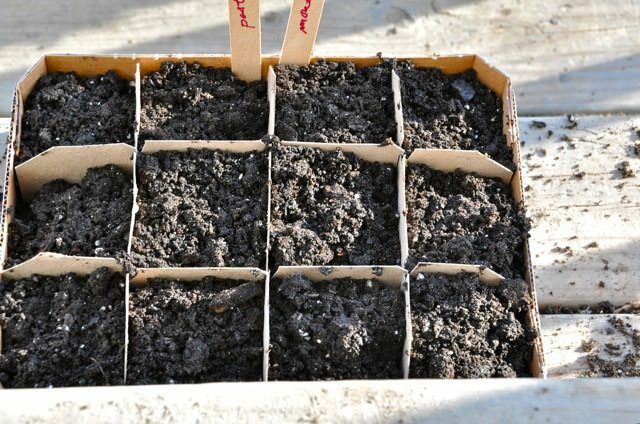 The bottom is open and the sides turn to mush (from all the water) by the time you are ready to plant, so they are ready to go directly into the ground. 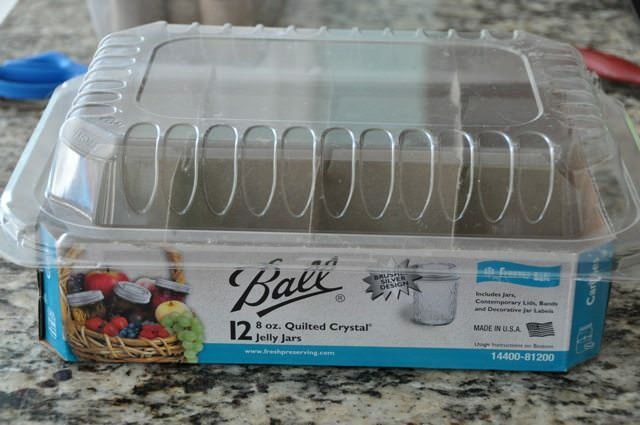 Other items I’ve saved include a box that my jelly jars came in, which already has awesome little divided squares in the middle, a cake pan lid, and two large plastic tubs that some Earthbound Farms organic spinach was sold in. 1. So after gathering your supplies, let’s get started. 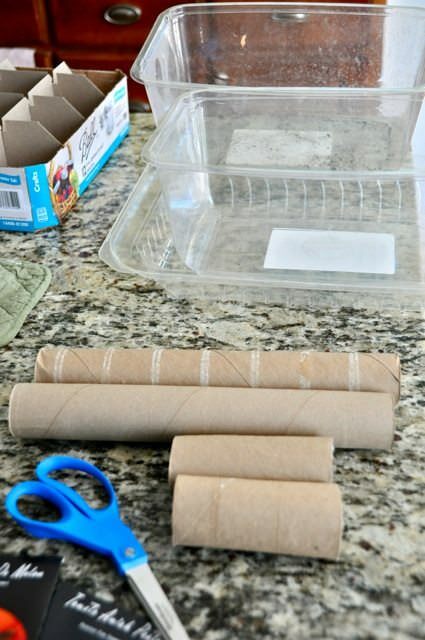 We try to reduce the amount of paper towels we use in our house to almost none… but we do have an emergency roll around for unexpected *treats* like dog poop in the laundry room or cat hairballs on the steps. 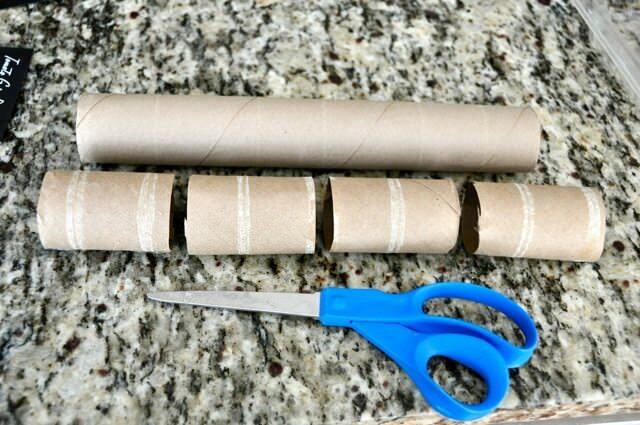 When we do finally use up a roll of paper towels, we always save the inner tube. 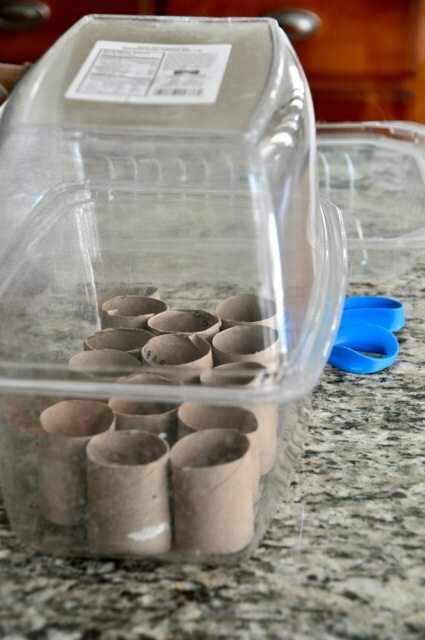 These make amazing seed pots… just snip a roll into fourths as shown (and snip toilet paper rolls into halves) and you are all set! There are probably a million people all over the planet doing this already, but I have never heard of it… so when I thought of it last year, I was pretty darn proud of myself. I used this method last spring and it worked out perfectly, so I can say for sure it works! 2. 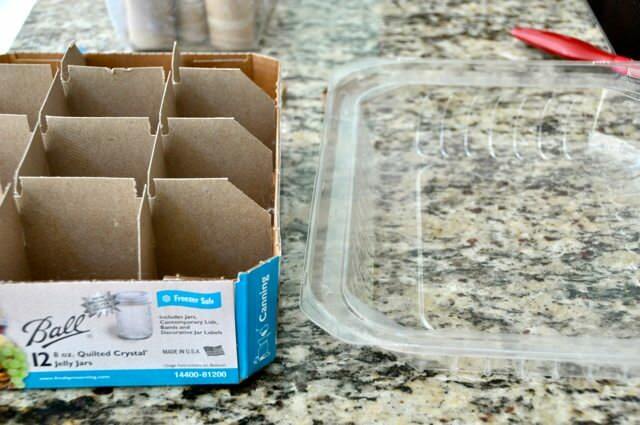 Just line up the tubes inside a container of your choice (could be a recycled plastic container like this, or a cardboard box like in my next example…) and you are ready to add soil. 3. To make a lid for your *green greenhouse* just find a top that fits… more often then not an upside down version of the exact same bottom works perfectly! I used heavy duty packaging tape to secure one side of the top to the bottom, creating a sort of hinge so that I can open it up and water the seedlings as needed. 4. Here is my second make shift greenhouse combo… I’ve saved a cardboard box that happened to have divisions in it from shipping jelly jars (if you have a plain cardboard box or shoe box with no divisions, just fill with the aforementioned toilet paper tube seedling pots we created!) and will be topping it off with a recycled cake cover I salvaged from a friend’s party. 5. Voila! Be creative here… this obviously isn’t perfect, but it is eco friendly and it is free. When the seedlings get too large for the lid, I’ll just remove it. The lid is only important in these early weeks as the lid will keep the seeds constantly moist (and thus sprout more quickly) and a bit warmer. Right now, it’s warm enough for me to have these seedlings, safe in their greenhouses, on my front porch! In a month, as they outgrow these lids, they won’t need them anyway, and into the recycling bin the lids will go! 6. Here they are, ready to go out to my backyard to fill with soil and compost. We just take some soil right out of our amended garden beds… they will be replaced soon enough, with a plant in it! I also had a small bag of organic potting soil, so I mixed that on in as well. 7. 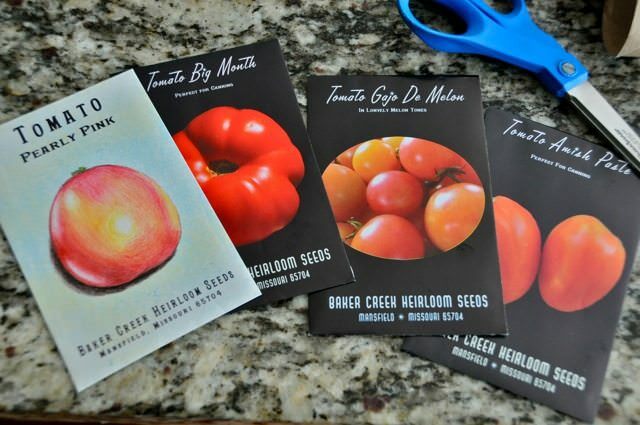 Here are the seeds I’ll be growing in these greenhouses. Tomato plant from Baker Creek Heirloom Seed Company… Pearly Pink and Gaj0 De Melon for eating fresh, Big Month and Amish Paste for canning. 8. 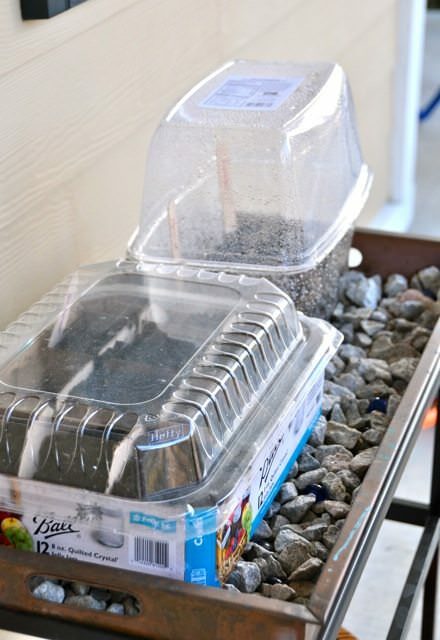 Just fill those puppies up with your soil… sprinkle the seeds on top, cover lightly (or plant according to the package directions) and water gently. 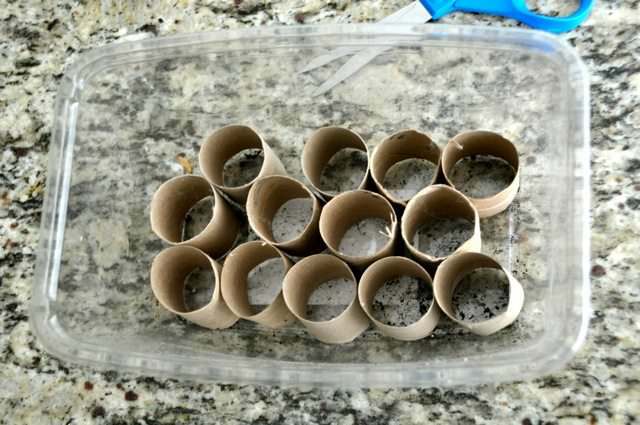 I put about 4 or 5 seeds into each section/cardboard tube. Send ’em some love from your heart, and cover up with the lids. We’ve got our seeds on our front porch in the full afternoon sunlight. I’ll keep monitoring them, as the world warms up and temps stay warmer overnight, and of course as the seedlings grow, the lids will be removed. Making sure to keep the seeds moist and happy and in the sun at least partially, these seedlings are on their way to becoming happy plants. As they grow, I’ll pick the strongest plant in each cardboard tube/section to grow, and remove the weaker seedlings. Or, if there are several strong ones, I’ll transplant them to share those with friends… seedlings make an amazing, loving gift this spring! 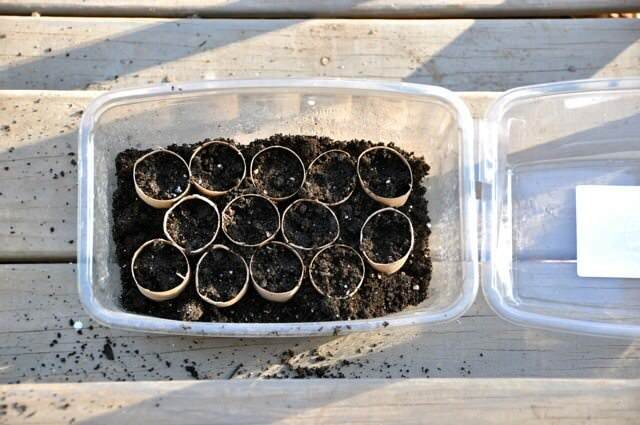 You can also put extra seedlings into pots for container gardening on your porch or gift giving as well.